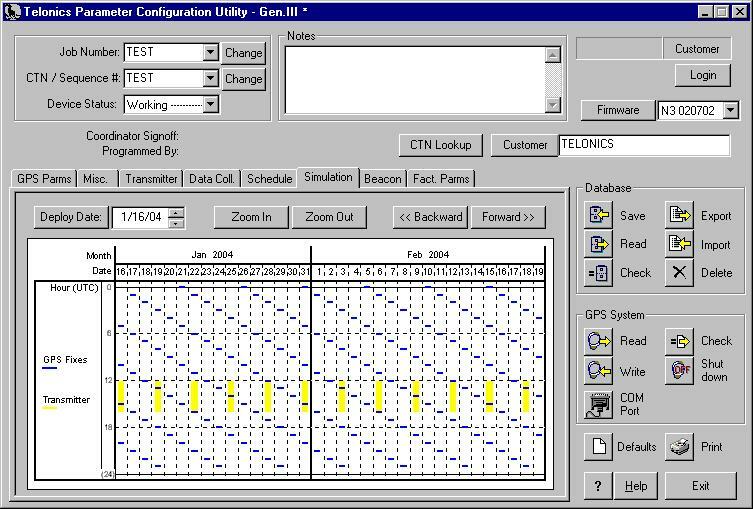 ﻿ Parameter Configuration Utility for Gen3 GPS - Software | Telonics Inc. Flexibility. Modify a configuration right up until deployment. Set up a pre-deployment test, transmission periods, gps fix intervals, and other parameters. Customization. Create a custom set of parameters specific to your application. PCU-3 is designed for ease of use. The software will provide printable reports detailing the schedules and options you specified. It will also generate warnings and error messages to help you correct potential problems. Once you have configured your system settings, you can save them to the database and can create as many configurations as you desire. Programming your system is as simple as connecting to it via a standard COM port and clicking a button. You can also retrieve the settings contained in your system and view or modify them in Parameter Configuration Utility. Another important feature of PCU-3 is the "simulation window", which provides a graphical representation of your customized schedules, both GPS fix schedule and Argos PTT transmit schedule. Use this feature to get an overview of the entire study duration. What's New in Version 3.04.0000? Added firmware support for "N4040816". What's New in Version 3.03.0000? Increased number of displayed scheduled fixes in "Simulation". This allows the user to see scheduled fixes further into the deployment schedule (up to the maximum on-board storage space. New firmware version allows user to enable or disable VHF beacon transmitter.